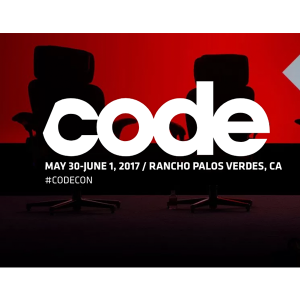 The invite-only Code Conference will be held in Ranchos Palos Verdes, CA from May 30th to June 1st, 2017. 3Pillar Global’s Jennifer Ives, the Senior Vice President of our Technology industry team, will attend this year’s conference. The conference will feature over 30 industry leaders offering their insights on a variety of topics, and will have over 500 companies and C-suite executives take part. Some featured speakers from this year’s conference include Hillary Clinton; Marc Andreessen, Co-Founder and General Partner of Andreessen Horowitz; Kamala Harris, U.S. Senator from California; and Ruth Porat, CFO of Alphabet Inc. and Google Inc. This year will also have a new addition to the schedule – Code Intensives. Some featured speakers from this section of the conference include Anousheh Ansari, Co-Founder and CEO of Prodea Systems; D’Wayne Edwards, Founder of Pensole; Jill Hagenkord, Chief Medical Officer for Color Genomics; and Andrew Freedman, Co-Founder and Senior Director of Freedman & Koski. For more information on Code Conference 2017, including a full agenda and information on the speakers and guests, please visit the official conference website.